The Barry Callebaut Group and its subsidiary Biopartenaire, a direct sourcing enterprise for sustainable cocoa beans, have launched a clean water campaign to deliver LifeStraw water filters and health and hygiene training to cocoa farmer communities in Côte d’Ivoire. The new campaign complements the company’s efforts to support communities in funding boreholes, water towers, school latrines and other infrastructure. Barry Callebaut aims to make cocoa farming sustainable and improve livelihoods by addressing community development needs in education, child protection, women’s empowerment and health, alongside actions to improve farm productivity. Working with communities to provide clean water and basic health services is one of the core focus areas of Barry Callebaut’s community development activities. 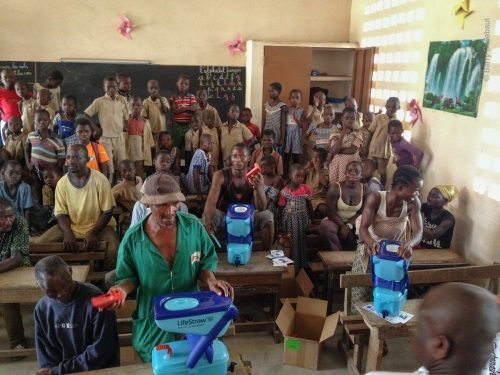 Training and water filter distribution events started in February 2015 and will continue through April 2015 in villages in the Taabo, Toumodi and Oumé regions where Barry Callebaut’s subsidiary Biopartenaire works directly with village-based farmer groups. The campaign was formally launched on February 17, 2015 at the primary school in the village of M’brakro. The school events were organized by local schools with support from Biopartenaire and attracted hundreds of people. The initial beneficiaries include nearly 1,300 Biopartenaire farmers who participated in training workshops and received a family filter for household use. In addition, 67 community filters, larger-capacity units for institutional use, have been distributed so far to 13 schools and 2 medical centers in the regions. The total number of units distributed during the campaign will reach 1,300 family filters and 120 community filters. An estimated 12,000 people will benefit, especially children under age 5, among the most vulnerable to water-borne diseases. “Providing filters to schools and health centers increases the availability of clean, safe water throughout the day for children and other people,” said Marina Morari, GM community development. Biopartenaire’s network of village coordinators was used to survey water sources and household and community needs. “Our village coordinators played a key role in communicating with farmers, most of whom cannot read or write, about the benefits of the water filters. They will also be involved in following up with families so we can assess the impact of the filters on households over time,” said Andres Tschannen, MD of Biopartenaire. The distribution of the water filters is the outcome of Barry Callebaut’s employee program Winning Together, which engages thousands of colleagues around the world in the company’s corporate social responsibility activities while fostering team spirit. Water for Life has now been extended through 2016 to reach more cocoa areas.